A new but current team have been formed as Aberbargoed Town join the North Gwent Premier League for the 2017/2018 season. Louis Moore gave an insight to the club on his blog ‘The Arm Chair Supporter’ before the clubs debut match against Caerphilly Town, a year-old club. Whilst Aberbargoed Town FC may be a brand new club, the players all know each other very well after spending the majority of last season together in the Neuadd Wen’s 2nds’ team. Neuadd Wen established all the way back in 2009 and several promotions have seen them reach Welsh League standard in a remarkable rise. The seconds quad had seen a variety of coaches over the last few years too but Ricky Vaughan took over the team last year and in a stunning season took the club to the league title along with the Bob Annett Cup. After with winning a Cup and reserve division title, the team decided to go rogue and set up there own club, Aberbargoed Town FC and show their ambition to progress through the leagues rather than potentially shine consistently in the reserve leagues. Whilst a number of players have decided to stick with Neuadd Wen FC, the manager seems to have managed to secure the core of last season’s squad including key player and captain Ryan James as well as top scorer Sean Chidgey with 26 goals in all competitions. The Coalmen are also on course to have one of the toughest defences in the league with Ryan Woods likely to be a commanding presence at the back or even in centre-midfield. 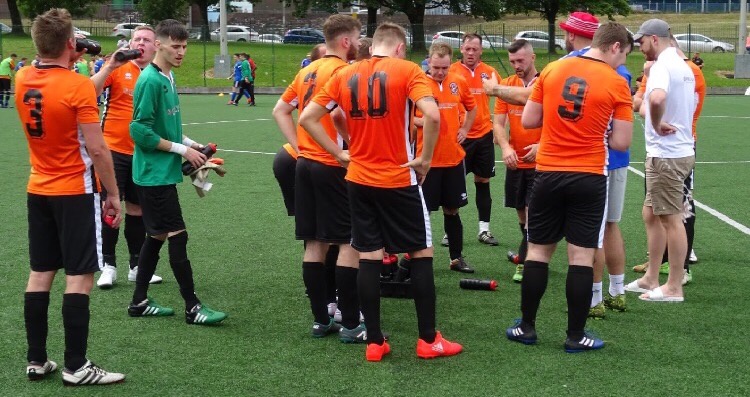 With a new club, a brand new kit was needed but rather than opt for a complete rebrand, Aberbargoed decided to stick with the orange and black combination behind Neuadd Wen 2nds’ domestic success of 2016/17. The lads also will be sponsored by Caerphilly firm Hobbs Valve in their inaugural season. Besides the kit, a new badge was designed and as Aberbargoed is historically a coal mining town, the badge pays homage to its roots with a Coalminer being the centre of attention, giving the club the obvious choice of nickname, the Coalmen. The new club will play their debut season in the North Gwent Premier League and will also play home games at Cefn Fforest’s Welfare/Stute pitch. Aberbargoed Town FC will have their kit proudly sponsored throughout the 17/18 season by Envirovent, one of the UK’s leading manufacturer of ventilation products.